3. SPECIAL DVD COMBO: Both our DVDs at a great price! 4. Sophia Wolff & the Cubs' CD: "Afternoon Fun"
Sick of dancing like Richie Cunningham? Become a Fonz at last, with this exciting, fast-paced video and go from absolute basics to advanced tricks of the trade of '50s Rock'n'Roll Jiving - as seen in London, Los Angeles, at Viva Las Vegas and on TV. In one hour, Miss Wolff and partner Snakeman Jes teach you the basics of 1950s jive — the way rockabilly rebels like it! Packed solid with tons of moves, everything you need to be confident and show off on the dance-floor! Very easy to follow, even for the rhythmically challenged. Amazing value for all the moves packed into this! About 6 months' worth of classes, signals, interruptions, spins, circles, fancy moves and taught by the original North-American jive pioneers, who brought this type of dancing to this continent over two decades ago. 60 minutes - color - English - Chapter per move/per practice song. Music is real rockin' courtesy of Deke Dickerson & the Crazy Rhythm Daddies . The 2010 sequel to our first DVD! Learn how to DO THE JIVE with 2, 3, or 4 people! Packed solid with wild advanced moves! Three-way jive! Rockabilly thief! Jive Sharking! How to jive with 2 couples, switch partners without missing a beat, wild on the floor moves, and much more. Learn to Stroll and Bop too, from beginner to advanced! Ever wondered how strollers twist and turn, dance backwards, dance half time, get that great wiggly style invented in London? Ever wanted to get the feel for a floor full of dancers while the blues boppers are pounding the airwaves? Search no more - ALL ROCKIN' DANCES are covered here. Great value for 3 dance style content. - STROLL : learn Beginner to Advanced with turns, etc. Buy both our DVDs and save money too. 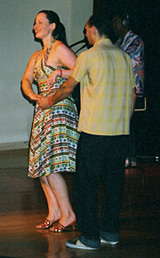 Learn to Jive, Stroll and Bop from COMPLETE beginner right through to VERY advanced, even if you have two left feet! Everything you need included, with great music and instruction. - JIVE : learn Beginner to very Advanced Jive moves, specialty moves with couple exchange on the dance-floor without stopping your dance, 2-follower dancing, getting down on the floor and keeping the beat, etc! Chapter per move & chapter per practice song. Music by Sophia Wolff & the Cubs, Deke Dickerson, The Howlin' Hound Dogs and the Crazy Rhythm Daddies. A real rockin' seven piece that'll rock 'n' roll you from country, rockabilly and blues to saucy French serenades! Ten original songs written by Sophia like "You Can't Lose When You Choose Booze", "Playgirl" and "Rockabilly Boy"! For track listing see the Cubs' site. With fiddle, steel, piano and Noel Thibault on guitar, this all-star band includes Ray Condo's original drummer Peter Sandmark, some Howlin' Hound Dogs and Go Cat Go author Craig Morrison. CHECKOUT PAYMENT METHODS: PAYPAL - easy & FREE to sign up with a debit card / credit card / bank account. CLICK on the yellow ADD TO CART buttons to access the Checkout page, you will be able to modify quantities/edit/remove/cancel on the next page. In the USA, Priority ship: $6.95 for up to 2 items. $13.95 for up to 4 items, $19 for 5 items and upwards. This is less than we pay to ship items. *Worldwide combined shipping costs start at $13.95 for up to two items. * Your item(s) will arrive within 6 weeks unless overnight shipping is requested. Most orders will ship out within 3 days unless we are away. * To check on your order, ask questions or wholesale orders: please email us.